Vermont's Voice For Nurses–and All of Us! On this site in the past, I’ve tried to highlight the work of nurses who have taken their patient advocacy into the arena of public policy making and electoral politics. Mari Cordes, a nurse of twenty-eight years, the last sixteen at the University of Vermont Medical Center in Burlington, has done both. 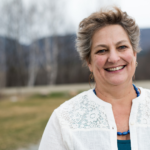 After tireless campaigning for single payer health care in the Green Mountain State and for safer nurse-patient staffing ratios in her own hospital, Mari has become a candidate for the state legislature. Before taking this plunge into local politics, Mari served as president of a 2,000-member nurses union, affiliated with the American Federation of Teachers. In that capacity, she both represented her co-workers in contract negotiations and day-to-day grievance handling and served as a constant presence in Montpelier, the Vermont state capitol. There, she helped draft bills and organize community support for paid sick leave, an end to health insurance plan discrimination against transgendered patients, and better regulatory oversight when local hospitals are sold to for-profit operators. In recognition of her leadership role in Vermont health care, the current Democratic Governor, Peter Shumlin, named Mari to a Commission on the Future of Nursing and two other health care policy advisory boards. She also found time to do critically important “disaster zone” volunteer nursing work abroad—in post-earthquake Haiti and, more recently, on the island of Lesvos, which has been flooded with refugees from the Syrian civil war. This summer, Mari is sticking closer to home in Lincoln, Vermont and three neighboring communities that comprise the legislative district where she is running to be a member of the state house of representatives. She is knocking on doors, speaking at house parties, and attending candidate forums, all while still working 12-hour shifts as a nurse on a cardiac care unit. She is among thirty candidates in Vermont who have been inspired, in part, by Senator Bernie Sanders’ campaign for the presidency. Bernie has been a longtime supporter of nurses throughout the state of Vermont and nationally, including the nurses at the Veterans Health Administration. Like her friend Bernie, Mari is dependent on small individual contributions to finance her campaign. Our family has already donated and my daughter (herself a nurse) has joined Mari’s campaign team, as she has been inspired by Mari’s dedication to her patients, her fellow nurses and, most importantly, to building a more accessible, equitable, and just healthcare system for us all.